The newly established yard, Cape Racing Yachts, has made good progress with the build of two 5th Generation, Owen Clarke designed Class 40’s. Manufacturing started in May this year and both boats are expected to launch early in 2017, in time for the new racing season. The first boat has been purchased by Henrik Bergesen of Norway; whose family are well-known as the owners of the ketch rigged 105’ Wally, Nariida. 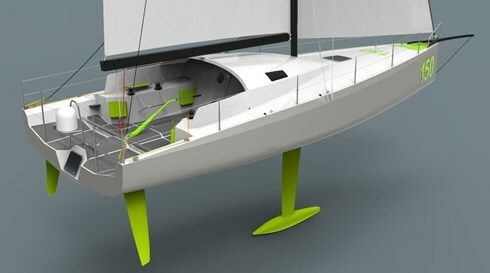 Henrik plans to campaign his Class 40 in Europe next season, before building up to some transatlantic races. The second boat will be campaigned by world renowned sailor, Jörg Riechers for two seasons on both sides of the Atlantic. Jörg dominated the Class 40 circuit in 2012 and 2013 with his successful Mare’ campaigns. Jörg says: “It is a pleasure for me to be involved in the project and campaigning the boat, as I am a big fan of Owen Clarke Designs. To be involved from this early stage and add some of my Class 40 experience will be a bonus once we are on the water"
Jörg will team up with German Olympic sailor Robert Stanjek for the Project. Robert has represented Germany in the 2012 Olympics in the highly competitive Star fleet and was Star World Champion 2014.